German physician; born in Hamburg 1788; died there 1843. After taking his degree he traveled in Norway and Sweden, and finally settled in London, where he was ultimately appointed assistant surgeon at a military hospital. In 1811 he became assistant surgeon (with the rank of lieutenant) to the 5th battalion of the 1st division of the German Legion, and accompanied his battalion to Spain, where he took part in the Peninsular war. In 1813 and 1814 he followed Wellington into France, and returned to England on the accession of Louis XVIII. Gerson was present at the battle of Waterloo and superintended the Hospital des Visitandines. On the breaking up of the German Legion in 1815, he returned to Hamburg, where he earned the gratitude of the local authorities by improving the anatomical institute of that town. His surgical practise afterward increased rapidly, and he retired in 1835, occupying himself with the editorship of the "Hamburger Magazin." 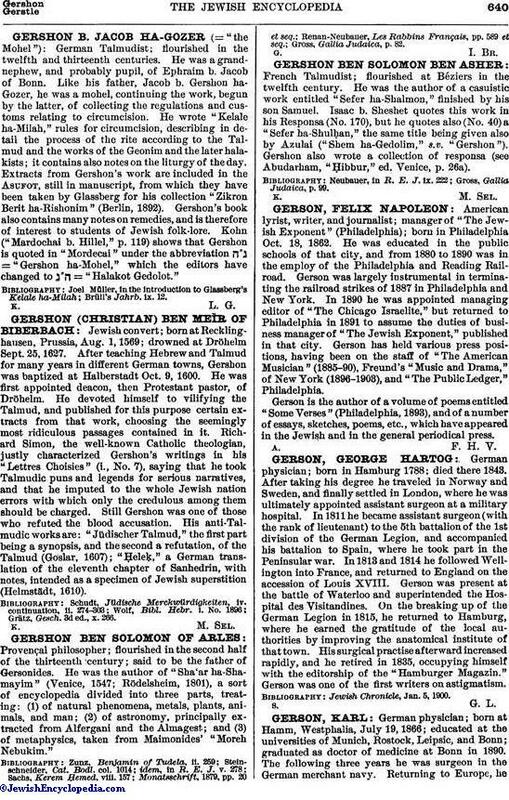 Gerson was one of the first writers on astigmatism. Jewish Chronicle, Jan. 5, 1900.